Top Pet TweetersRemembering Ella Fitzgerald classic tune "Let's Do It," back in the 50s, an updated version of that song might in today's Internet world focus on how the various species on this planet are just as attracted to "Twitter" as they are to "falling in love." Based on the number of pets that have taken to tweeting out 140 characters or less, it can definitely be said that Twitter is an all-inclusive ecosystem. And while the Twitter logo is a bluebird, it's become clear that Twitter is not just for the birds, nor Homo Sapiens for that matter. Here is a list of some of the top pet tweeters in the world, categorized in order of the number of followers they've been able to attract. 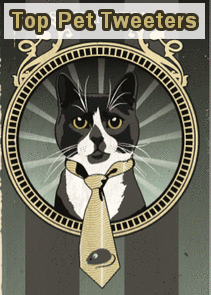 1,442,120 Followers: @Sockington (aka Sockamillion) could be considered the "Ashton Kutcher" of the pet world. Truly a rags-to-riches story, "Socks was first spotted homeless on the streets of Boston meowing for food, when Jason Scott took it upon himself to provide him with food and shelter. Today, According to his blog, Sock's bio admits to living "a life of luxury" complete with a copious amount of "tuna and cat toys" and over a million Twitter fans to boot, commonly referred to as 'Sock's Army' amongst his friends! 8,684 Followers: @EricasFish (aka Robert Jove Merton "Merty" for short) - who states on their blog, that "yes, Erica owns a fish who became an Internet superstar by tweeting about life inside her apartment from the vantage point of her fish's bowl." 4,020 Followers: Karma (aka @TruckindogKarma)- In the soon-to-be-released documentary "Twittamentary," one of our top pet tweeters is about to receive some attention on the big screen. Owner Desiree Wood (aka @TruckerDesiree) who is also featured in the film, rescued the dog who she cured of heartworms, thanks to what she describes as the "kindness of Twitter' (more on Desiree's and Karma's back-story can be found on my previous post, here). 3,936 Followers: @RudyTheParrot - residing in Arlington, VA says, "I fly, therefore, I am" and gives credit for his Twitter voice to his human spokesman,@Pavahotti - who, by the way, has a lot less followers than his fair-feathered friend. 3,748 Followers: @CaplinROUS - found in Buda, near Austin, TX claimed to be "a ROUS (Rodent of Unusual Size)"- but unfortunately passed away on January 4, 2011 - underscoring how Twitter can be also used as a digital sanctuary for folks to go and remember one's beloved pets, after they're gone. 3,490 Followers: Pecan (aka @LilPecan) - located somewhere within the Boston environs, Pecan's bio indicates that she is "Twitter's exotic rodent strategist" who is " opinionated, irreverent" and doesn't require anyone to "clean (his) cage." As she "gradually spreads his paws outward to the rest of the Internet," Pecan also maintains a blog where she communicates to her followers regularly. 1,101 Followers: @KarmaFerret - literally 'found' in NW Illinois, Karma is one of 22 very fortunate ferrets residing at the the Critter Camp Exotic Pet Sanctuary. For those that think the 'pet rescue' efforts in the US are limited only to dogs and cats, Critter Camp is here to show you that all the pet species on this planet deserve to be rescued as well. 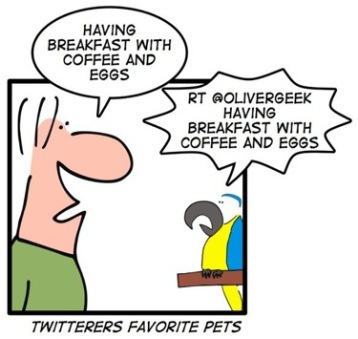 So, as you can see, the Twitterverse could also be considered the Critterverse - as there are lots of opportunities for your pets to use the microblogging platform to communicate about their own special interests and needs, in addition to just being a place for them to post their daily musings. And who knows, someday, perhaps Ella's prophetic lyrics might even lead to others species to join in, where "bees (will be) doing it / even educated fleas (will be found) doing it (and if) Cold Cape Cod clams, 'gainst their wish, (might) do it, (perhaps) even lazy jellyfish could (eventually) do it." Now, I would like to hear from our readers to find out what pets I may have missed in my TOP PET TWEETER listing? When you comment, please note the URL or @TwitterHandle so all of our readers can enjoy communicating with your pets - and perhaps following them as well.